51'6" by 5'10" by 8'6"
The XE-class midget submarines incorporated some lessons learned from the X-class midget submarines that disabled the German battleship Tirpitz in Norway in late 1943. They were somewhat less suicidal to operate than their Japanese counterparts, with several of their commanders and crew surviving to collect their Victoria Crosses in person. Their most famous exploit in the Far East was the sinking of cruiser Takao at Singapore on 30 July 1945 by XE-1 and XE-3. 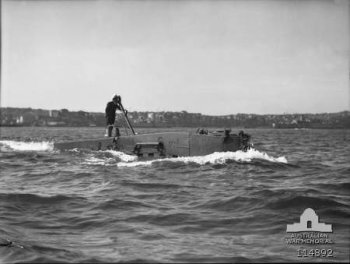 The boats carried two charges with their own ballast tanks, which gave the charges neutral buoyancy at operating depth. The charges were attached using magnetic clamps affixed by divers, who left the midget submarine via a floodable chamber. Although they had a much greater surface range than their Japanese counterparts, they were typically towed close to their operating area by a mother submarine, usually of T class. They could be towed at a speed of about 10.5 knots at the cost of 5.5 percent of the endurance of the mother ship. Six of the craft arrived with tender Bonaventure in July 1945.